Stuntmans Skullcover turned from southern rebelflag to starspangled banner ... I want the old rebelflag on my stuntman cape back!!! I cant go on missions in that new cape ... it makes me look fat. Pls fix that, thx. Edited by Ghost Recon, 03 July 2017 - 03:19 AM. That's like asking if con wants to make money. They will come in time. 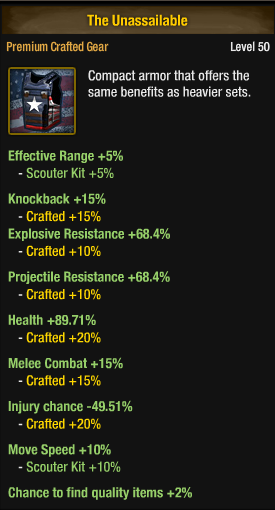 Not a bad craft, found in trade channel just now. Wow that's a great craft! Can someone give us a pic of the new melee craft? Although i doubt it's better than arc-burn. I gave found 2-3 budget boxes daily so far. For me, the rate was more or less the same than other events. I ended up opening a lot more, though, so maybe is just a matter of perspective. It's the best freedom week! Since 2014, the clothing, the weapons are always much better! When are the replicas of last years stuff going on sale? Is there a comunity task to to? There was an error on Kong, sorry! I've activated them now and extended the cutoff by another 3 days. Con. The Independance boxes are still dropping again. You know, event boxes always keep dropping for a few days after the event. I've always assumed it's intentional, to give collectors a chance to stock up some more boxes in case they still haven't found a piece of clothing they want, but I'm not sure about that. They will probably go away when a new series of Premium Supply Boxes arrive. The declaration grips, upper receivers and shield sections are about as rare as the patriot parts, which as a non-DMU user is not too rare but certainly not enough to gather 100. I played at least once each day of the event and at the end of it, excluding uncrates never even got close to 100 patriot parts. Going on from the first point, please don't put the unlock options for the event crates for items like the declaration grips, receivers and shield sections (i.e parts that only require 1 of to craft the required item), because they feel more like a massive waste compared to the other items from the crates. I'm a non-DMU user too, and I was struggling at the beginning (many years ago) to find event components. I don't know what's your level, but for me what works is to send 10 one-man auto missions to low-level places once a day and regular 3-man missions once a day, plus the Island; I found about 500 parts before I started opening boxes and crafting, 5 days after the start of the event. I've been playing since 2012, I'm no stranger to the way the item drops works but I shouldn't have to resort to automating low level missions to get the components to craft even just one of the event items. It's only been a recent trend (as far as I've noticed, since Halloween last year for the EXO suits) that you usually may not get enough components to craft unless you're using DMU or uncrating the components. Also the crates this event dropped a lot less than previous events, I have two accounts for this game and on both accounts I've only dropped 5 each. The crates aren't advertised as much as a risky gamble as the trick or treat boxes though, the trick or treat boxes have straight up garbage in them. Their 450 x 5 price tag vs the 450 x 10 price tag for skeleton keys kind of show that too.